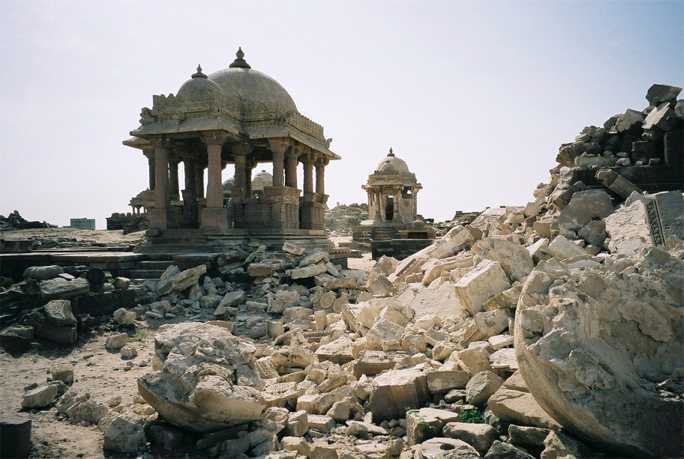 BHUJ: Earthquake damage at the Chhatris, a monument under the protection of the Archaeological Survey of India. 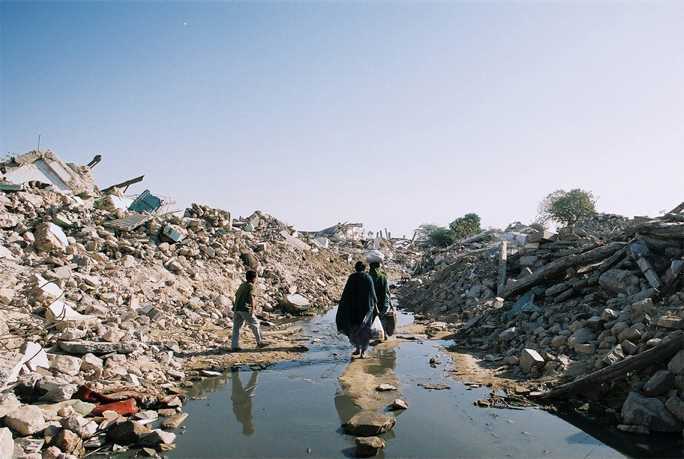 The magnitude 7.7 earthquake that struck Gujarat, India at 8:46 AM on January 26, 2001 killed approximately 20,000 people and devastated a large number of villages and towns over a wide area of western Gujarat. Over 600,000 people were rendered homeless. 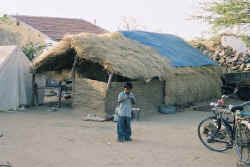 The damage was particularly severe in the Kutch Region. Damage estimates in US dollars are estimated to be about $1.8 billion. Unlike many recent earthquakes that have tended to more severely affect particular types of structures, this earthquake had a profound effect on structures of all types, from ancient to modern, from traditional masonry to contemporary reinforced concrete. In the city of Bhuj and in Kutch as a whole, the form of masonry bearing wall construction most commonly found in the region proved to be particularly vulnerable to earthquake damage. 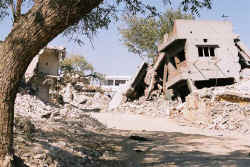 For those buildings which have survived, the level of damage is often extensive enough to make them particularly vulnerable to (1) being demolished hastily on the grounds that they pose life safety risks, or (2) being subject to further damage from monsoon rains when the annual monsoon comes, which is usually in late June. The report that follows is focused on the cultural heritage properties affected by the earthquake. The UNESCO mission was undertaken in order to gain a quick perspective on the impact of the earthquake on heritage properties, and to assess what are the priority needs that outside assistance through UNESCO may be able to provide.. The UNESCO survey of the area undertaken by Randolph Langenbach, from the United States, began in Bhuj on March 1, and ended in Ahmedabad on March 17, 2001. The following report is intended to give an impression of the damage sustained to heritage sites in the area, and to identify potential recovery and restoration efforts potentially suitable for UNESCO support. The cities and villages visited included the following cities visited in the Kutch District were: Bhuj (population 121,000), Anjar (51,000), Bachau, and villages in Bhuj-Bachau area including Paddhar, and Kabaru. Those cities visited on the Saurashtra Peninsula (also known as Kathiawar) were Morvi, Jamnagar, Wankaner, Limdi. 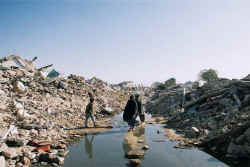 The final stop in Gujarat was Ahmedabad (2.5 million), which was the eastern-most site of significant damage and loss of life. ANJAR: View of a street in the old city. BACHAU: The whole city appears like this, with little evidence of its former appearance. 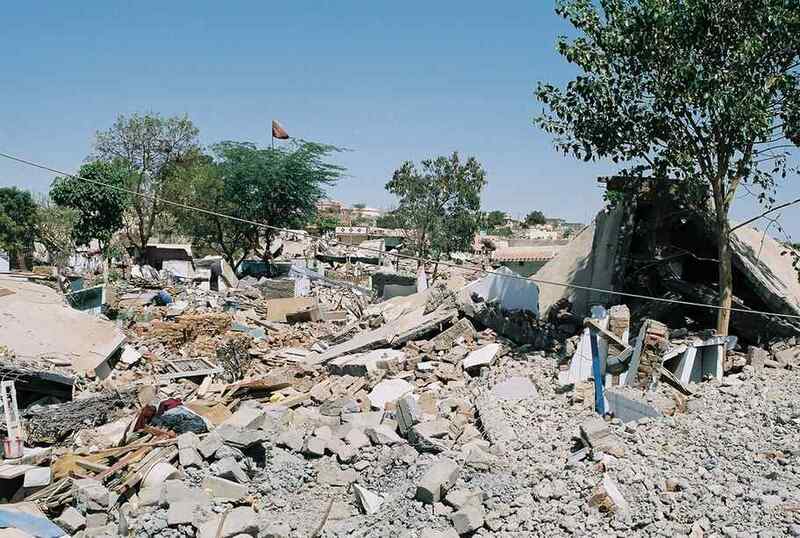 What was most striking about the Bhuj Earthquake of January 26, 2001, were the scenes of complete destruction in certain areas. 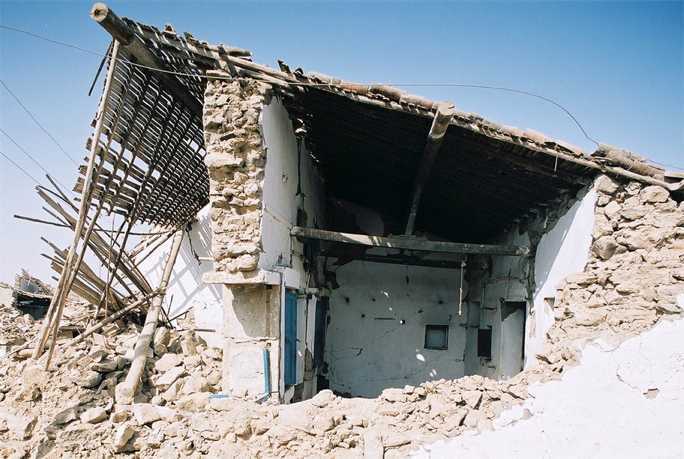 Even in Turkey, when in 1999 the Kocaeli Earthquake also killed over 20,000 people and leveled vast numbers of reinforced concrete apartment houses, there were no scenes such as one found in Kutch - where one could stand and turn 360 degrees and see nothing standing. In many cases, even the salvage of personal belongings was not possible, as the mountain of heavy stone and concrete rubble covered everything. In Anjar, 400 school children gathered to march in the Republic Day parade were killed as the walls of the buildings on either side of the street fell outward on them. Escape from the narrow street was impossible. 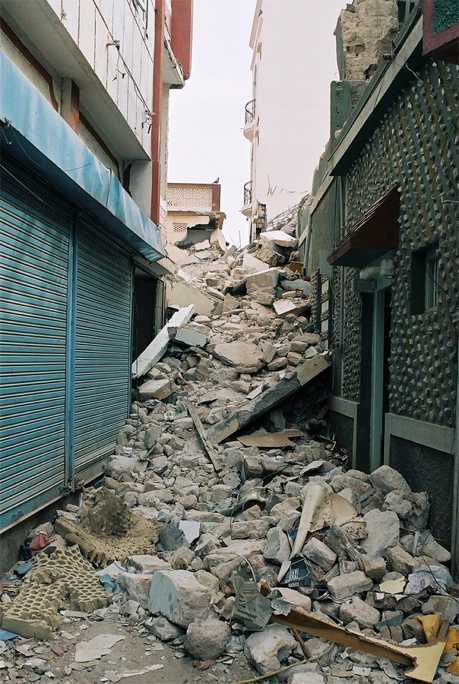 Unlike what occurs with many earthquakes, such as the recent earthquakes in Turkey in 1999, where the damage is concentrated on particular buildings types - such as rubble stone masonry structures, or modern mid-rise reinforced concrete buildings - the Bhuj Earthquake affected a broad range of building types, from traditional masonry to modern reinforced concrete. Although there was no instrumentation in place at the time of the earthquake to measure the ground motions, except far from the epicenter in Ahmedabad, by witnessing the damage, it is evident that, near the epicenter in the heart of Kutch, the shaking was severe. One member of the family of the Maharaja of Kutch, Ghanshyam Sinh Jadeja, described his experience of standing in a doorway of his apartment in the city palace holding on to the 2-foot thick doorframe while he watched the building collapse in front of him. While standing there as the shaking went on seemingly for ever as three stories of stone and timber continued to fall where he had stood only moments before, he said to himself, “Dear God, this is long enough, please STOP!” His perception was that the strong earthquake shaking lasted for at least two long minutes. The records show that the strong motion lasted for 85 seconds while the lighter shaking lasted longer than that. The length of time of the earthquake shaking, as well as its maximum severity, undoubtedly accounts for the widespread damage. BHUJ: Darbargarh: Old Palace showing collapsed section where Ghanshyam Sinh Jadeja, nephew of the Maharaja of Kutch narrowly escaped being crushed under the collapsing historic library in the old palace. In terms of the impact on historical buildings, two things stand out from this earthquake. First, the common construction style for secular domestic and commercial buildings in the cities and the villages in the damage district appeared to be particularly unsuitable for a seismic hazard region. Second, except for Bachau, where the destruction extended across the entire city leaving very few buildings of any construction type still standing in useable condition, the total destruction appeared to be concentrated in certain areas. This may be best explained by local geological conditions, rather than building construction quality differences, as there did not seem to be enough variation in the building typology to account for the difference in performance. Within the walled city area of Bhuj, for example, one could find large areas where practically every building was collapsed, whereas, only blocks away, it was possible to take photographs that show little evidence of the earthquake. On the whole, however, the damage to historic buildings, and sites of cultural heritage significance was both severe, and widespread. The Kutch region has a long history which had left its mark on the land with many historic buildings and structures, including city walls, forts, palaces, temples, great houses, and civic monuments. There were also more humble, but none-the-less historic, structures from traditional rural mud, stick and grass houses (known as “bungas”) to urban rubble stone multi-story houses in the cities of Kutch and Saurashtra (Kathiawar). The affected communities can be divided into two categories: Villages and cities. The cities category includes cities and towns of 25,000 people and up which possess an urban infrastructure, as opposed to the many small villages for which Kutch is famous. The villages largely consist of one-story dwellings and a school, and have been able to survive in recent years based upon an agrarian and handicraft local economy. The villages and cities have significant differences in terms of heritage conservation needs. In the case of cities, the losses are more diverse, and the cultural heritage needs are more varied. However, more than in the villages, the need to save the historic fabric of damaged, but surviving historical buildings is more important, and the candidates for protection and restoration are more numerous and widespread. Typical village dwelling constructed of rubble stone and light timber with little seismic resistance. The untied heavy stone walls crumbled from the vibrations because of the lack of through-wall bond stones. The taller walls, often two stories high, as shown here, to support the gable of the roof, were also vulnerable to being thrown over because of the lack of a roof diaphragm. (1) Villages: Kutch is a semi-arid region characterized by many small village settlements. Much of the cottage industry of handicrafts for which the region is well known takes place in these villages. The earthquake effectively brought this economy to a halt by destroying most of the houses in many of the villages. Some villages reportedly lost a third of their population from the collapsing buildings. In the case of those villages that were heavily damaged, the cultural heritage is primarily resident in the preservation of a building tradition and the settlement pattern, rather than in specific monuments or heritage structures. As has been sharply illustrated by the widespread resistance to government-imposed relocation, the cultural heritage largely resides in the settlement pattern on the land and social structures of the community rather than the physical fabric of the individual buildings. Also most of the village houses were of a particularly unsafe form of stone construction. Even if still partially standing, damaged houses of this construction are not well suited to be restored because of the separation of the walls from the floors and the crumbling of the walls themselves. Most such buildings will have to be dismantled and rebuilt from scratch. This is because of the complete lack of wall ties sufficient to hold the walls to the floors, and the rubble stone in clay mortar masonry which has simply shaken down and apart from the earthquake vibrations. This is an example of a rectangular "bunga" newly constructed since the earthquake. This form of construction, indigenous to the area, and common before stone and concrete had supplanted it, proved far more resistant to earthquake destruction than either the stone or concrete construction which had been perceived prior to the temblor as more permanent and durable. In those more remote villages, where the bunga type of grass, wood and clay house construction was still common, the damage was less severe. These seemingly temporary and less substantial traditional house type proved to be less vulnerable than the pucca stone, or the concrete construction that people had replaced them with when they modernized. It is from the bunga construction type that some valuable lessons could be learned to help reintroduce a lighter weight and safer building tradition back into the region. Recovery of community memory and the preservation of culture is thus best realized in these cases by (1) providing assistance in the self-help construction of houses using local indigenous materials, and (2) providing guidance on increasing seismic hazard protection within the context of the local vernacular architectural style and configurations and (3) encouraging the reconstruction of these villages in a manner that is most likely to restore the sense of community and settlement patterns that existed before the earthquake. Consistent with this approach, in its March 14, 2001 Report Gujarat Earthquake Recovery Program the World Bank has emphasized the importance of self-help in the construction of replacement houses, and the successful rebuilding of the villages. a. Religious monuments such as temples, mosques, shrines and memorials: These can be divided into protected ancient monuments, and active religious sites. (In the case of the Mogul monuments under ASI protection in Ahmedabad, many remain in active religious use, but responsibility for their conservation rests with the Government of India. 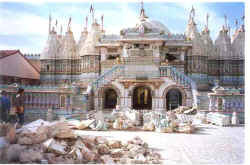 Other religious sites, such as the Bhadreshwar Jain Temple in Kutch are in active use, but also are of ancient origin. b. Secular ancient monuments, such as fortifications, city walls and gateways, palaces, civic structures (such as public markets and meeting halls and other government buildings), commercial buildings, and formally designed historic houses. Some secular monuments are protected, either under the ASI or the Gujarat State Government. c. Urban houses and some commercial buildings of traditional construction and vernacular architecture. The layout and cultural morphology of the city plan and the enclosed urban spaces which make up the historic old city areas in Bhuj, Anjar, Morvi, Jamnagar, Limbdi, and others not seen during this mission. This earthquake is distinguished for the breadth of its destructive power – having laid waste to some extraordinarily large areas. 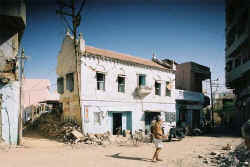 For example, the entire city of Bachau, near Bhuj, was essentially flattened. In spite of this, there were a remarkable number of historical buildings that did survive, at least in a potentially restorable condition. However, because of the extent of the damage taken as a whole, and because of the fact that so many very significant buildings are neither under governmental protection nor have available resources for emergency protection (shoring or artifact recovery) or long term restoration, many of these sites are at great risk. On this UNESCO sponsored reconnaissance mission to the area, the following immediate needs have been identified, and the author now proposes the following series of actions as the initial, emergency UNESCO cultural heritage rescue and recovery endeavor. Please note that the cultural heritage losses can be classified as falling into the following three categories, and the recommended conservation strategies are different for each category. (1) Ancient monuments currently under governmental protection: either under the Archaeological Survey of India (ASI) or the Gujarat State Government. This category includes religious and secular structures. Most of those in ASI protection inspected in this mission that were damaged by the earthquake are religious structures, including mosques and tombs dating of the Mogul period in Ahmedabad and the Chhatris and Shiva Temple in Kutch. The city walls, gates, and forts are either under state or local protection, except that some of the city gates in Ahmedabad are under ASI protection. (2) Ancient monuments and historical buildings of regional and national significance that are not under protection: This also includes religious and secular structures. All of the Maharajas’ Palaces, and most of the urban civic, commercial and residential architecture fall into this category. The earthquake has seriously affected sites in all three of these categories, and the following observations are made for each such category. 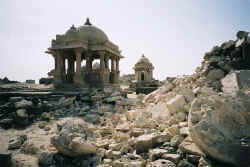 BHUJ: Chhatris showing collapsed Raolakha Chhatris on right. (1) Protected Monuments: Protected monuments fall under two different governmental jurisdictions. Some of the most important are under the ownership or control of the Archaeological Survey of India (ASI), and others are under the jurisdiction of the State Government of Gujarat, local government, or which are owned by local organizations as museums. The ASI has a number of the most well known Islamic monuments in Ahmedabad under its protection, but has only one site in Bhuj, and one other site in Kutch, the ancient stone Shiva Temple in Kotay, a small village to the north of Bhuj. 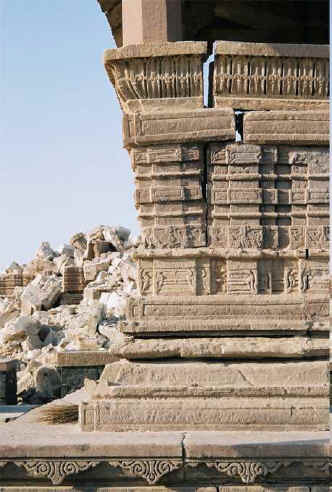 Approximately 12 of the ASI monuments in Ahmedabad suffered damage, some of which was serious, but all can be restored. In the case of Bhuj, the ASI has jurisdiction over the Chhatris which are funereal monuments constructed on the site of the cremation pyres of the maharajas. The earthquake collapsed the oldest and most important of the Chhatris, the 18th Century Rao Lakha Chhatri (also called the Lakhpatji Chhatri). This was an elaborate open stone pavilion, with a central dome and twelve smaller domes lining its stepped façade. The earthquake caused it to completely collapse into a formless pile, even though it had survived the great 1819 earthquake almost two hundred years earlier. Restoration will require the careful recovery and sorting of the stones, the re-carving those pieces that cannot be conserved, and the reassembly of the structure. Most of the stones appear to be recoverable and reusable, as the stone quality was fairly good. A number of the other Chhatris are badly damaged, with one having lost its top open pavilion, and another with a wide crack in its dome. Interestingly, the site is marked by several plinths on which chhatris had once existed, and there are many stones about which have been organized as to detailing. Reportedly these chhatris collapsed in the 1819 earthquake and were never reconstructed. The Shiva Temple in Kotay was only slightly damaged, with some of its exterior stones displaced, and some spalls on the interior where it had shifted. The temple was under restoration at the time of the earthquake. Those monuments under the protection of the Gujarat State Government are more extensive, but a complete list of the sites under state jurisdiction was not available. State jurisdiction probably includes the original city walls in Bhuj, which suffered greatly in this earthquake, as well as the Lakhota Fort and Bhujia Tower in Jamnagar, which were also damaged. The top of the Bhujia Tower was partially demolished because of the earthquake damage. (2) Monuments of national importance not under protection: Of those monuments not under protection, the most significant ones found on this mission to be at the greatest risk are the original “Darbargarhs,” the city palaces of the former kings of the princely kingdoms that at one time made up the region. The Darbargarhs pre-dated the coming of the British, and thus contain architecture, art, and sometimes-even artifacts, dating back several hundred years with less influence from Europe. During the British Raj period, many of these Maharajas constructed new palaces on the edges of the cities and towns, moving out of the center of their cities and away from their subjects. As a result, some of these original palaces have seen little use for close to a hundred years. They have remained essentially in mothballs hidden away from view except for a few sections which are open to the public, such as the Aina Mahal Museum at the Darbargarh in Bhuj. While many of the British period palaces are also architecturally significant and damaged as well, it is these older palaces that have been identified on this mission to embody the most cultural and historical significance to the region and to India as a whole. At the time that they were constructed and over the centuries that they were used, they formed the administrative and cultural center for the princely states. Darbargarhs in Bhuj, Morvi, Jamnagar, Wankaner, and Limbdi were visited on this mission. This included a more detailed inspection of those in Bhuj, Jamnagar, and Wankaner. These palace complexes were inspected at the invitations of the Maharaja of Kutch's family in Bhuj, Jamsaheb, the Maharaja of Jamnagar in Jamnagar, and Dr. Digvijay Sinh, the Maharaja of Wankaner. The In addition to these sites, other smaller palaces and darbargarhs in the region have been brought to our attention as having significance, and extensive damage. Of these palaces, the interiors of two were examined in detail – the Darbargarh of the Maharaja of Kutch in Bhuj, and that of the Maharaja of Jamnagar in Jamnagar. Entering parts of these extensive complexes was like entering a lost world with extensive evidence of a rich a varied history, as well as possessing significant artistic and architectural details. Artifacts, some with evidence of not having been disturbed for more than a generation or two, were stacked or arranged in hidden rooms in these palace complexes – rooms which remained locked and protected until the earthquake has now broken them open and placed the buildings and their contents at immediate of loss and destruction. In one section of the Bhuj Darbargarh, in the oldest part of the original palace, a room which is reported to have been the library of the Maharaja with books dating back more than 100 to 200 years has collapsed, burying the books and artifacts under tons of debris. Unless the remains of this area are shored up, and the books recovered before the onset of the monsoon rains, they will be lost. 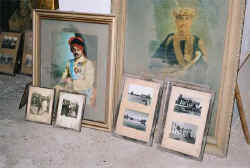 JAMNAGAR DARBARGARH; Rooms full of dust covered pictures of former nobles, princes, kings and views of the city - with the images visible only after the dust was wiped off - were opened up after the earthquake for the first time in years. In the case of Jamnagar, the Jamsaheb personally lead the site visit of the ancient palace complex, which was located in the heart of Jamnagar, but exists today as a hidden and nearly forgotten complex of ancient buildings. Because new palaces had been built in the early part of the 20th century under the British period on the outskirts of the city, this original palace has rarely been used for almost a century, and hardly at all for the last 30 years. 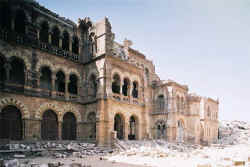 The Jamnagar Darbargarh suffered significant damage in the earthquake, but not nearly as extensively as did the one in Bhuj. Visiting this complex was more like walking through a lost city, than a single building, with courtyards opening off of courtyards, each with its own distinctive art and architectural presentation. With the commentary by the Jamsaheb, the deep history of the place came alive as we passed through dusty rooms filled with wall paintings, mirrors in gilt frames, and thousands of dust covered and decaying artifacts of a departed way of life - a way of life, however, which existed near enough in time to be still within the living memory of some within the city. In rooms now cracked open in places by the earthquake were wall paintings showing armies of olive shaped eyed men and women in settings from battlefields to palaces and ashrams. 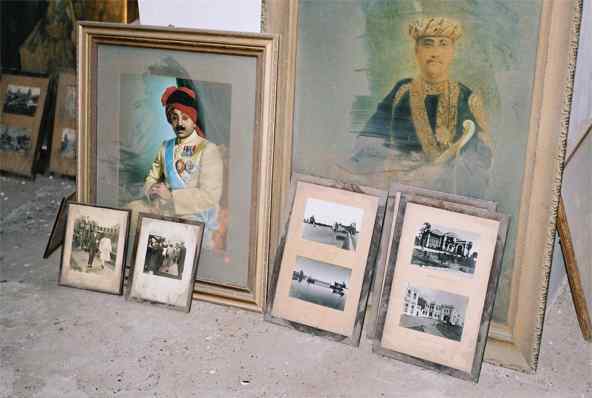 In other rooms, thirty years of dust accumulation had to be swept away to reveal portraits of bejeweled princes, and photographs of city monuments. In one corner was an entire crate of ornamental swords in their scabbards. In another room – unseen by all but a few for several generations - was a room completely lined with ornamental mirrors and paintings – not unlike the one found in the Aina Mahal Museum in Bhuj, which now also is partly collapsed. The rooms in this ancient palace were for the most part small and intimate, not grand or vast, as found in the later palaces. Instead of being designed to impress one of wealth, they bespeak a way of life that was uniquely Indian – as the palaces in the pre-British period were not houses only for the Maharaja’s but small cities that housed the entire court that served as the government of each kingdom. The state of limbo that the Palaces of the Maharajas are found in today are a product of the vast changes in the political culture which has taken place in India over the course of both the nineteenth and the twentieth centuries. With the final loss of power with the founding of the democratic national government, and the uniting of what had been originally been a multitude of small independent kingdoms into modern India, it is not surprising that the heritage of the former kings would be ignored for a time. However, the earthquake has served to bring attention to the fact that behind this recent history lies a significant part of the heritage – not just of the Maharajas – but buildings and artifacts which embody the art and culture of the people of the whole region over the course of hundreds of years. A second category of monumental structures, not under government protection, but of national importance are religious structures of ancient origin still in active use and under the ownership of religious organizations or congregations which have maintained them for centuries, but which may not have the resources to respond to catastrophic earthquake damage without gaining outside assistance. This assistance may be forthcoming from the wider religious community of which the site is a part, or it may be necessary to gain some assistance from the secular sources based on the cultural value of the site. One example of a damaged active religious site in Kutch, not under government stewardship or protection is the Bhadreshwar Jain Temple near Mandvi in Kutch. This site was outside of the area visited on this UNESCO mission, but was submitted with the request that it be added to the report. The information provided here has been generated and submitted by Environmental Planning Collaborative (EPC), a non-profit planning firm in Ahmedabad on behalf of the management board of the Bhadreshwar Temple site. The temple, which is a large and complex masonry structure dating back to the 12th Century, with later expansions and modifications. It was damaged severely enough to make it unusable until it is either repaired or dismantled and reconstructed. BHUJ: This is an example of an historical dwelling in the walled city of Bhuj which was heavily damaged. It is privately owned, and has been a family dwelling for many generations. 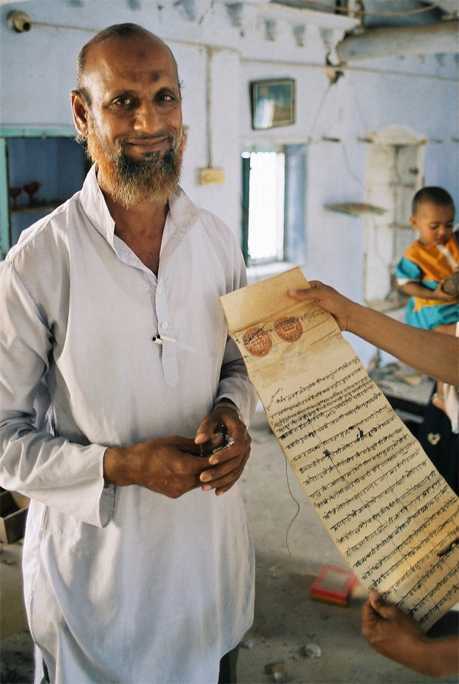 The second picture shows the owner, M.H.Pir with the original deed for the property shown when he invited us in to see the interior. (3) Character-defining heritage structures in urban areas not under protection: The third group of heritage buildings at risk are the historic houses and commercial structures that are character defining elements of the historic walled city areas, particularly in Bhuj and Ahmedabad, where the walled city area had retained much of its historic character, despite many encroachments. 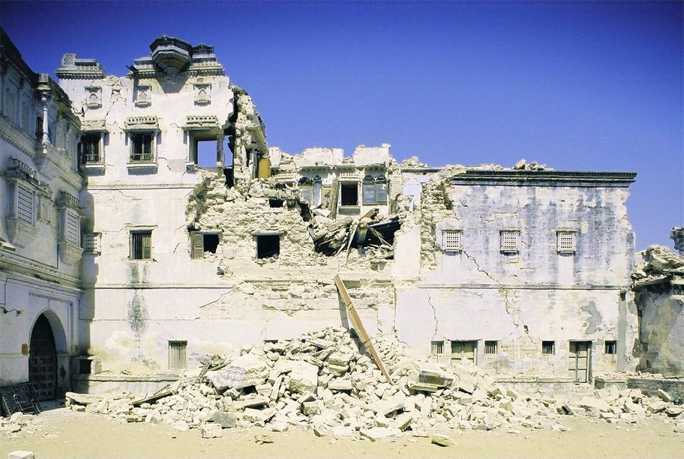 In Bhuj, because the shaking was so strong, and because the traditional construction was particularly vulnerable, many of those buildings that have not collapsed are none-the-less in need of emergency shoring, documentation and artifact recovery. If this is not done soon, buildings that may be possible to save will be lost to demolition in the name of safety and cleanup without any record. Saving some of these character-defining buildings in the Walled City of Bhuj is very important, especially in light of the great debate that has surrounded the government’s efforts to move people to a new location. After pursuing a plan to relocate the center of Bhuj to a new site for almost two months, the government agreed to pursue reconstruction at the same site after strong opposition to the plan had lead even to public demonstrations. The residents and shopkeepers had expressed a strong desire to remain and rebuild at the existing historic location of the city, while the government for two months after the earthquake had kept the electricity and water turned off in the walled city area to discourage people from moving back. In Anjar, the situation is quite different. This earthquake is the second within living memory to destroy much of the area as the earthquake in 1956 is reported to have leveled the old city center area as well. Much of the area is totally destroyed, leaving only piles of stone rubble surmounted by broken bits of the upper stories of buildings. As one penetrates farther, there are buildings still standing, but most have major damage. ANJAR: The earthquake destroyed most of the buildings which had been rebuild since the 1956 earthquake had devastated the same old city area. After much pressure to move, and because of the extreme damage – giving evidence that the site had experienced a unique level of shaking, the citizens have agreed to relocate. In this case, the attempt at relocation after the 1956 earthquake led to the construction of Naya Anjar, or New Anjar, which is nearby. It is an open settlement of small one story houses on wide streets - more on the model of Gandhinagar, than a traditional Kutchi historic town – a suburban, rather than an urban model. In 1956 this had failed to attract most of the population of Anjar. Most moved back to the old city area, which was rebuilt without attention to the earthquake risk, only to be knocked down again. While not heavily damaged and thus proven safe from a technical standpoint, the 1956 relocation attempt failed to make a successful new city. It was anti-urban in character. The challenge for the reconstruction after the 2001 earthquake is to find a model that again creates a city as a place, which can serve as the center of an urban culture, not just as a place safer from the effects of earthquakes. In the case of the Old City of Ahmedabad, the situation after the recent earthquake is quite different, but no less significant. In Ahmedabad, the traditional style of construction included many seismic resistive features such as timber frames, lacing and ladder belts in the masonry walls. These elements served to resist earthquake damage. However, some of the older historic residential structures in Ahmedabad have suffered earthquake damage in the form of masonry cracks, damage to roofs, and separation of elements leading to falling hazards. This damage has placed a number of buildings at risk for demolition in response to hazard mitigation orders. The most significant emergency assistance that is needed here is the execution of emergency shoring. India is an ancient land, but a relatively young country. Historic Preservation legislation is as yet relatively undeveloped at the governmental level. The Archaeological Survey of India (ASI), originally founded during the British period, has control and is charged with the responsibility of preserving designated ancient monuments of National importance. Unfortunately, the ASI’s mandate and limited funding limits it largely to the protection of the monuments under its control. The ASI does, however, have experts in the field of archaeology and civil engineering, and also restoration craftsmen capable of undertaking restoration on the ancient monuments under its care. In terms of international links and support, the ASI has developed links with international NGO’s, and is currently undertaking an historic landscape restoration project on Humayun’s Tomb in New Delhi with the Aga Khan Trust for Culture. The World Monuments Fund, a New York based Foundation, is also involved with projects in India, most notably, Jaisalmer, Rajasthan. In 1984, a new non-governmental organization, The Indian National Trust for Art and Cultural Heritage (INTACH) was founded to help fill the gap. This organization is national in scope. It is modeled in part on the National Trust in Great Britain, although it has not acquired properties, as has the British National Trust. INTACH has received some government support, but it remains an NGO dedicated to preservation advocacy, public education, communication, and professional conservation planning and technology consulting. Other national and regional groups have emerged in recent years that are dedicated to heritage conservation, including the Forum for Indian Heritage and Conservation, based in New Delhi. In Gujarat, the non-profit Environmental Planning Collaborative (EPC), although not strictly a preservation organization, has been involved with urban conservation issues. In 1997, they completed the Ahmedabad Walled City Revitalization Plan, with a grant from the U.S. Agency for International Development (USAID). EPC is currently involved with the post-earthquake recovery effort through the coordinating NGO Network Kutch Navnirman Abhiyan (Abhiyan). The international relief and reconstruction effort is overseen by the United Nations Development Program (UNDP), with offices in New Delhi and a field office in Bhuj. (1) Emergency shoring and stabilization of buildings at risk, including temporary weather protection from monsoon rains. (2) Emergency documentation of those historic elements or critical buildings which cannot practically be kept standing or restored, but which can be reconstructed, or which can provide critical information for other buildings being conserved or reconstructed. (3) Recovery of books, paper artifacts, and glass-plate negatives (reported to be under fallen material in the Aina Mahal Museum), pictures, and decorative arts objects. (4) Consultation with regard to development of long-term seismic strengthening and life-safety standards suitable for public use of affected masonry heritage structures. (5) Consultation on strategies for adaptive re-use for those buildings currently at risk because of underutilization prior to the earthquake, and which are in need of suitable future use to justify and support restoration. The aim of this UNESCO assistance project is to avoid sending an advisory group to the affected area solely for observation purposes, as there have already been a number of foreign advisory groups, but rather, to use the UNESCO initiative as a catalyst for implementing work in the field on specific heritage properties at risk of critical importance where time is particularly of the essence. The principal Indian host organizations would be the ASI and INTACH, but links with the entire recovery effort undertaken under the UNDP would also be important. Also, the above needs are best broken into two phases, with the immediate UNESCO assistance concentrated on the immediate emergency need for shoring, weather protection, structural stabilization and artifact recovery. The second phase will include design of long-term structural upgrading and adaptive re-use. This specific UNESCO proposal described below is focused on this first emergency phase. A document and decorative arts conservator. In the second phase, it is proposed that the team be expanded to include an expert in construction, an expert in international conservation law and legislation at the local and national level, and possibly also a tourism economics expert. In both phases, each of these professionals is proposed to have an Indian counterpart. One member of each team will act as a project manager. The Archaeological Survey of India will provide a building contractor with rigging, scaffolding, shoring and masonry stabilization and construction experience. The set-up and management of this UNESCO Heritage Initiative in the field is intended to fit together with the on-going UN-based relief operations that are already based in Bhuj, and it will draw from the extensive experience already gained from those operations. Depending on the resources, and the number of individual sites where work is undertaken, individuals on this team may cycle in and out, so that the work can continue for longer than it may be feasible to gain the services of a particular individual in each category, not unlike the way the human relief agencies have carried on their work. Since the completion of the above report, the Indian National Trust for Artistic and Cultural Heritage (INTACH) has competed their preliminary survey of damaged heritage sites. In that survey, INTACH has developed a list of over 400 buildings or building groups with restoration needs. The estimated cost for the 300 of them for which they have gained rough estimates is the equivalent of over $25 million US (using 45Rs/$). Because of the time that has passed since the earthquake, this update will describe how aspects of the Phase I can be combined with some of the longer term aspects of Phase II, depending on what resources do become available for the project. Also, the possibility of the participation of ICCROM in the establishment of a technical training course on post earthquake rehabilitation and conservation of historical structures to be held in the earthquake area allows for the introduction of a significant educational component into the program. Depending on the total available funding, these activities will include all of those activities described above including the Emergency shoring, artifact recovery and documentation, as well as the technical structural repair consultation and reuse consultation. This project update is divided into four principal activities: (1) Documentation and initial development of Protection and Repair Scope, (2) Hands-on conservation, including emergency protection, and permanent repairs, (3) Education, including engineering and architectural training specific to the repair and strengthening of earthquake-damaged structures. (4) Consultation on economic revitalization and reuse of underutilized heritage structures, tourism development, and legislative initiatives to help protect the sites and the encourage investment. (1) Documentation: The documentation component includes the provision of financial and technical assistance to (a) the Archaeological Survey of India (ASI), (b) The Department of Ministry of Culture of the Government of Gujarat, (c) any relevant local governments, and (d) the Indian National Trust for Art and Cultural Heritage (INTACH) to support on-going recording and documentation efforts undertaken, and their extension to include the delineation of plans and cost estimates, where needed, of the highest priority projects. The technical assistance will include, if sufficient funding is available, the utilization of current technology for rectified photography, stereo photogrammetry, computer databases, and other technology as appropriate. (This current technology documentation work will also link to the training component below.) Also, as part of this documentation component, the identification and selection of the structures for the hands-on conservation component will be made. (2) Hands-on Conservation: This component will be divided into two parts, depending on availability of funds. The first part is the provision of assistance towards the stabilization and protection of damaged heritage structures against rain, fungus and vermin. The second part is the carrying out of permanent repairs on specific selected heritage structures. Both parts will be done in conjunction with India based technical teams. The financial assistance in this component will be used to supplement funding from other in-country sources, including the Indian State and National Government. The objective in selecting projects for assistance is to: (1) enable the preservation of heritage structures which otherwise are most at risk, (2) enable the repair of structures which will have the most beneficial impact on the local community, (3) enable the employment of local crafts persons and laborers in the conservation and repair work, and (4) enable the development and demonstration of cost-effective repair and seismic hazard protection strategies of the most benefit to the repair of other structures in the communities in which the demonstration projects exist. Where feasible, these demonstration projects will also be linked to the educational component described below. (3) Conservation Research and Education: The third component of this UNESCO proposal is to develop and carry out the teaching of an expert course or series of courses aimed at the training of practicing professionals in the fields of Architecture, Engineering, Building Restoration, Materials Science, and Architectural History. This course is proposed to be developed by The International Centre for the Study of the Preservation and Restoration of Cultural Property (ICCROM), also a U.N. based intergovernmental organization with years of experience in the international training of conservation professionals. As funds are available, this educational component would be a short course or a series of short courses to be held on-location in Kutch and in Saurashtra, the two districts most affected by the earthquake. Research Topics (1) In addition to the teaching, if funds are available, the same leadership group of Indian and international experts could also carry out research on topics related to the improvement of conservation and rebuilding techniques to make such work more economical and appropriate to the local cultural and environmental conditions. Such research can include work on the development of construction materials and methods that are lighter and stronger than both (1) the traditional rubble wall masonry construction historically used in the area, and (2) the common form of reinforced concrete construction that has, together with the masonry, proved to be so vulnerable in earthquakes. The objective of this research is to avoid a radical departure from historical and cultural traditions, but rather build upon this background while improving the safety of the buildings with an economy of means. It is also important to develop forms of safe building practice which can be undertaken by the people themselves, rather than remain dependent on the importation of highly industrialized processes which only serve to divorce the people from the building process of which they have been a part for generations. Research Topics (2): Another topic for research and teaching that could be beneficial falls into the realm of environmental conservation and restoration. Rather than being divorced from heritage conservation, environmental restoration may be an essential ingredient. Kutch and the rest of Gujarat and Rajasthan have suffered from centuries of over grazing and timber harvesting that undoubtedly have had climatological effects. Much of the earthquake area is over-run with a kind of thorny shrub like tree known as “Kikar” locally, which is not originally native to the area. Parts of the region have apparently once been forested, but long ago this forest cover has been lost, and the amount of annual rainfall has declined in this century. An area that needs to be investigated, where rebuilding and land management comes together is in the potential for growing and harvesting building materials – such as wood or other converted agricultural products or fining uses for the Kikar trees. Improvement in the ecology, land management, and a regeneration of lost agriculture is important for the economy and quality of life of the area, and research and education is fundamental to making that happen. ICCROM has an international reputation for education in the field of building construction and conservation. In addition, Jamsaheb, the Maharaja of Jamnagar, has offered to provide a site for the establishment of a permanent educational institution dedicated to the preservation of the Gujarat crafts, and the conservation of historical buildings. This course may help to establish what could become an important institution of regional or national importance. (4) Consultation on economic revitalization of heritage structures, tourism development, and legislative and legal protection: The fourth component is proposed to be the participation of an international expert in the planning, financing and economics of tourism specific to the adaptive reuse and interpretation of the kinds of heritage resources that exist within the damage district, and also a legislative and legal expert. These experts would work with the Indian colleagues to help analyze the current and future situation, and to develop strategies for strengthening the local economy of the affected areas through the improved utilization of these resources, and the protection of those resources in ways other than direct purchase by the Government. The legislative work is intended integrate with and to build on that already being undertaken by INTACH. These experts will work with the planners of the planning teams selected by the Gujarat Government for each of the major affected cities in Kutch, and with INTACH and the ASI and other governmental agencies by developing a series of economic forecasts and recommendations, and local analysis of the impact and benefits of different types of protective legislation. This updated UNESCO proposal has two objectives. One is to aid directly in the repair and reconstruction of damaged historical buildings in the cities and towns. The second is to aid in the research, development and dissemination of knowledge about reconstruction and strengthening methodologies that are most sensitive to the local building traditions, but which are non-the-less able to provide a greater level of safety. In the job creation arena, the conservation, repair and reconstruction of buildings is one of the most important areas where traditional crafts and craft skills are intensively utilized. Many of the affected buildings are the repositories of important examples of traditional local crafts, and much of this work will need to be repaired or renewed. Such an approach also provides an important way for such crafts to remain in and benefit the areas in which they are created, rather than only being sold to distant buyers. The afflicted area of Gujarat has an architectural history that dates back two thousand years. The region contains many surviving heritage resources of great value some of which date back 100 to 500 years. Many of these were damaged, but not destroyed. In the long-term, it is these same heritage structures which will continue in the future to be a significant attraction for tourists while at the same time contributing to the local cultural base on which the continuation of the traditional crafts skills from generation to generation can be encouraged. The heritage buildings are the most visible, and often the most important physical manifestations of the rich cultural and craft history of Kutch and Gujarat as a whole. It is this cultural heritage on which the craft-based economy is based. The educational component of the UNESCO proposal, envisions a course or series of courses on safe construction techniques utilizing local indigenous technologies and materials in earthquake areas, and also on the safe repair and upgrading of earthquake damaged historical buildings. The earthquake threat requires modifications to the traditional building construction methods found in the heritage structures so that both the repaired structures and new construction will be more seismically safe, and still be able to utilize the locally available materials, craft techniques, and building typologies sympathetic to the cultural identity of the region. By also including a research component as part of this educational initiative, this proposal envisions supporting India-based research into culturally sensitive and economically appropriate construction techniques, so that improvements will be durable, rather than leading to the creation of alien developments in the historically sensitive areas. The transliteration of the name for this region has been variously spelled as “Cutch,” “Kutch,” “Kachh,” “Kutchh,” and Kachchh. The Govenment of the State of Gujarat uses "Kutch," so for the purposes of this report, Kutch is used throughout. Although not used frequently today, the name “Kathiawar” is the historical name for the peninsula to the east of Kutch containing the Districts of Jamnagar, Rajkot, Surendranagar, Bhavnagar, Amreli, Junagadh, and Porbandar. Historically, together with Kutch, it formed a region of tiny independent princely states, each with its own king or “maharaja.” For most of their history, they remained under Rajput control, while “Gujarat” in what is now Eastern Gujarat State, with its center in Ahmedabad, became an established center of the Moguls who dominated most of the rest of Northern India for centuries. At one time there were 188 of them. In 1924, fourteen of these independent states were formed into the “Western India States Agency,” with direct relations with the British Government. The British maintained and encouraged the continuation of the system of local kings and princes which had characterized and controlled the region for centuries, and many of these maharajas prospered during the British period, as the frequent local wars between the neighboring kingdoms were kept in check and the British helped to provide a limitless market beyond the region’s borders. This history of the area as independent princely states is an important part of the cultural background of both Kutch and the Kathiawar Peninsula, with many of the splendid buildings left behind from this history now threatened to be lost because of the earthquake damage. First with the establishment of the democratic Indian nation in 1948, and later with the final elimination of the “privy purse” in the 1970’s, all formal governmental power and responsibility of the Maharajas has been eliminated. The families still carry on the tradition of the titles, and many of them continue to have great prestige within their former principalities and beyond. Some have also participated in the Government of India through the democratic process, as has Dr. Digvijay Sinh of Wankaner, a former Minister of the Environment. Please note: As of June, 2014, this is a new address for mail from website-users. If you have not heard from me at my old address, please write again. Writings and photographs found on this website is ©Randolph Langenbach and other authors. For use permission, write to the address above.